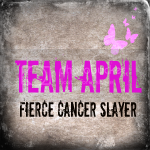 "Team April" folks: Want a button for your blog that looks like this? My awesome cousin, Anne, just designed this for me. You can put it on your blog or website and it'll link back to my blog. That way your readers can read my blog too, and know that you are part of this awesome movement of people helping me battle this crazy disease! It's the next best thing to a T-shirt. See the same image of the button over on the right? There is a box below with the code you need to grab it for your own blog or web page. Enjoy!